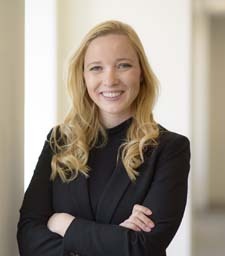 WASHINGTON (NASA PR) — Megan Powers has been selected by NASA Administrator Jim Bridenstine to be the agency’s press secretary, working in the Office of Communications. Prior to joining NASA, Powers served in the Executive Office of the President at the White House as the Senior Lead Press Representative. Her role at the White House involved traveling domestically and internationally on behalf of the president and the administration. Her responsibilities included representing the White House in press negotiations with external entities, facilitating coverage of and access to the president by the White House Correspondents’ Association and shaping messaging strategy for events outside the White House. Editor’s Note: Powers graduated from NYU in 2015, worked on the Trump campaign and transition for 19 months, and then served in the White House press office for 15 months. That adds up to less than three years of professional PR experience. And then she gets appointed as press secretary for a $20 billion government agency with no apparent prior expertise in the space industry. And she’s what? All of 24 or 25 years old? It’s going to be interesting. There’s Public Affairs staff at NASA Headquarters and at field centers spread around the country. Most of them will be older and more experience than Powers. I could see some real challenges there. Did she get the job because of loyalty to Donald Trump? Or is she really bringing some much needed expertise to NASA? I’d really hate to see NASA Public Affairs turn into some version of the White House’s shambolic daily press briefing. Let’s be clear: this has nothing to do with gender. It’s about experience and expertise. So, I will delete any sexist comments and ban people as appropriate. Any videos of her in action? The average age of NASA Apollo era engineers was 28 and the directors and managers more experienced than that. She’s a Press secretary, not a rocket scientist. I’m sure she will do just fine. And the White House press briefing is a disaster because the press make it confrontational. They pretend that the previous administrations never lied or at least stretched the truth. No they don’t, but previous administrations haven’t lied so often or doubled down when caught in a lie they almost always have changed the subject and moved on, repeated lies and attacking the press is unique to this administration, it is a fact that not every news outlet will present any president favorably, but they have every right to present them in unfavorable light. What sets this administration apart are the number of lies and the sheer brazenness of the lying. In that, Trump & Co. are in a class by themselves. But, then again, facts don’t matter; alternative facts do. Just a thought, but if you wish to connect to the young generation maybe it’s a good idea to hire someone from that generation? Someone that generation is able to identify with? how many fresh engineers were hired by NASA and put at the top? None that I know of. You might want to review what previous administrations had to say about the press. Obama was no exception despite the fact that nearly the entire legacy media would carry water for him and ignore his own innumerable lies and failures without even being requested to do so. Obama is the all-time champion White House dissembler by a large margin. I might be willing to credit that the average age of all NASA technical personnel was 28 during the 60’s, but most of the first-tier people were in their very early 20’s. No. And for good reason. But media flacking isn’t engineering. There are a lot of women her age in very responsible positions in civilian PR. And it’s not like her previous jobs were exactly go-fer positions. She’s had virtually nothing but high-visibility, high-pressure positions the last couple years. This NASA job might actually qualify as low-pressure by comparison. In any event, she ain’t exactly entry-level. She lasted two years in the Trump campaign and transition organizations and you’re questioning her tact? Those skills may have helped her get the job but lets stick to videos that show if she can or can not be a successful Press Secretary. After watching Sean Spicer and Sarah Huckabee Sanders….eff yeah! Doogiehowsereagle. Expert in engineering. Management. Government. Business. And now, apparently, PR. Hopefully she is good at the job after what happened today. Her boss just tweeted out breaking news about NASA late this afternoon literally in the middle of a Falcon 9 launch. It was rather startling to those on Twitter who understand how the media and PR work. Maybe this was Bridenstine’s mistake alone. Or maybe someone in Public Affairs thought it was a good idea. I don’t know. Why was this a bonehead move? Rather than explain it myself, I’ll leave that to the real expert here. Why? I just assumed they were not watching it. Afterall it wasn’t a NASA payload so why would NASA care about it? Does Ford care what Toyota is doing when it Twitts out a Press Release? Sorry, that is incorrect. How much did you wager? All of it. Oh, that’s too bad. But, thank you for playing. We do have some nice parting gifts for you. You know if No One cares a Falcon was launching when they twitted it says a lot about his routine they are becoming. You know the 90 day wonder on the 91st day. And you never mention the subject of it, a Mars Helicopter being added to the next Mars lander which is pretty cool in itself. A. It’s inconceivable that NASA’s unaware that SpaceX is launching from NASA’s Kennedy Space Center. C. The Falcon 9 Block 5 is crucial to NASA’s future because its the variant that will launch Dragon 2. NASA wants to see 7 successful flights before they put people on board. You can be damn sure that NASA was following the first flight. D. Friday afternoon is the time you dump news you don’t want people to know about. Like the suddenly resignation of a White House aide under an ethical cloud. The cancellation of a popular government program. Or the dump of embarrassing government documents you’ve been fighting for six months to prevent releasing. F. You don’t step on a news story (Falcon 9 Block 5 launch) with a partner your depending on to carry your astronauts to space. LOL. Again, it’s NOT a NASA launch, so why would they care about it? Sorry, you are just looking for talking to points to attack her since she is not your idea of who a NASA spokesperson should be, nor do you like Rep. Bridenstine. Yeah, apparently Doug was not too happy with that. Ford absolutely cares, and would be paying Attention. If you focus only on Twitter, you might have a point….or half a one. But seriously, do some stats on the posts on your site. I know my stats drop off sharply on the weekend…. It’s a qualifying flight for CC and contains a ridiculous number of NASA mandated changes. NASA’s been intimately involved with its development. But again it is not s NASA payload, it’s a commercial one. So some at NASA May watch it, but it’s not their press release/social media event. Which reflect an older demographic, which is probably true of most space advocate websites. Having someone who knows how to communicate to the 20 something’s, and women, at NASA will be good. Written by whom and appearing where? Doug, the reason why this has occurred is that it is an attempt at payback for Musk having distanced himself from the Trump administration a little while ago. They have been waiting for an opportunity to do so but at the same time to not appear to be un-American. Spiteful little children. Bye-the-bye, my dear departed father gave me some good advice once, he told me, Paul don’t continue arguing with fools, as sometimes people looking on can’t tell the difference. Regards, Paul.